Exclusive! Perfect for a day of fun in the sun, or at least wishing you were back at the beach with your toes in the sand! 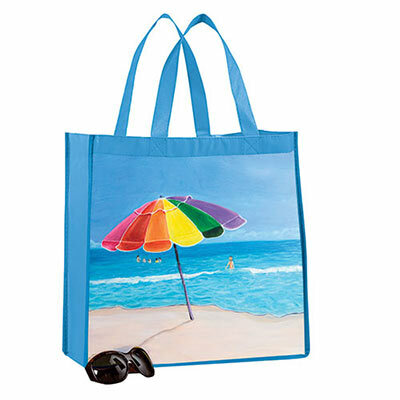 Fun, roomy Beach Umbrella Tote features original artwork printed on both sides. Durable, non-woven polyester coated for easy cleaning. Imported. 14"w, 12"l handles. I always love Paragon totes but this one is my favorite! I get many compliments on it and it always makes me feel like I am on the beach!